A Pew Research Center survey released earlier this week explored the public’s attitudes on an intriguing question: If new medical treatments could slow the aging process and allow people to live decades longer, to 120 years and beyond, would they personally want to have such treatments? The survey found that about four-in-ten U.S. adults (38%) would want to have such treatments, but a majority (56%) would not. There were some differences on this question among demographic groups. For example, men are somewhat more inclined than women (43% vs. 34%) to say they would want medical treatments that would dramatically extend their lives. Younger adults (ages 18-49) express more interest in receiving such treatments than adults ages 50 and older (42% vs. 34%). Significant differences on this question appear among racial and ethnic groups. Hispanics and non-Hispanic blacks (46% each) are more likely than non-Hispanic whites (34%) to say they personally would want life-extension treatments. Blacks and Hispanics also are more likely than whites to see medical treatments that radically extend life as a good thing for society. Roughly half of Hispanics (48%) and 56% of African-Americans say such treatments would be a good thing, compared with 36% of whites. As the report notes, there may be many, overlapping reasons for these racial and ethnic differences. 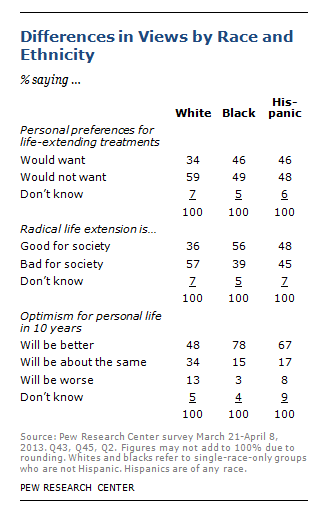 For one, blacks and Hispanics hold distinctive views on a number of survey questions that tend to correlate with opinions about radically extending life, such as being more likely to expect that such scientific breakthroughs will come to pass by the year 2050 and being more inclined to see the growth of the elderly population as a good thing for society. Another question that is modestly related to beliefs about radical life extension is optimism about the future. About three-quarters of blacks (78%) and about two-thirds of Hispanics (67%) expect their lives to be better in 10 years than they are today. By contrast, about half of whites (48%) say the same. And while only about one-in-ten U.S. adults overall (9%) say they would like to live to more than 100, blacks (15%) are more likely to express this desire than are whites (7%) or Hispanics (6%). The reasons for the racial and ethnic differences in the survey findings on radical life extension are no doubt complex. Some leaders from the National Baptist Convention, USA, a black Protestant denomination, offered their views about why blacks may be more likely to want to live longer. “There is something in our historical fiber that might make us want this, after having been denied so much for hundreds of years,” says the Rev. Marcus Gibson, senior pastor of the Greater Shady Grove Missionary Baptist Church in Columbus, Ga.
Sandra Stencel is a former Associate Director, Editorial at the Pew Research Center’s Religion & Public Life Project.